So it goes when sketching becomes a tool for meeting people and networking. 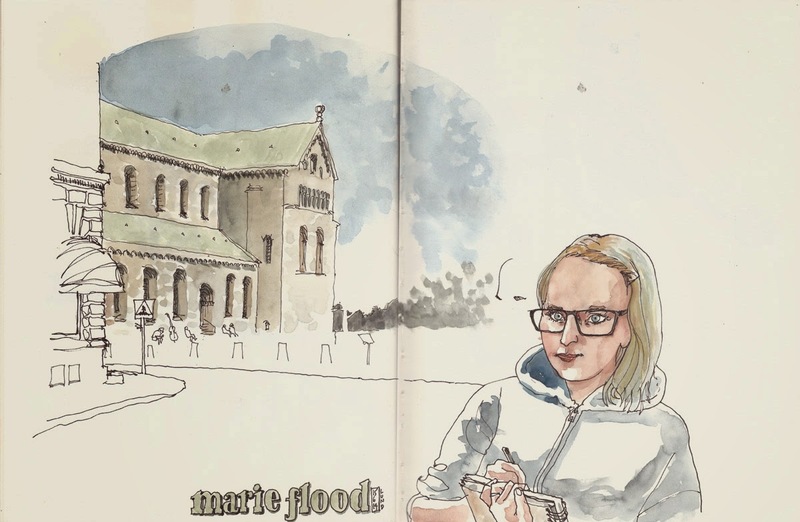 I had met Marie Flood some months ago, during the exhibition at Martas Café. She was there as part of a fanzine market and we talked about meeting afterwards to sketch together. And we did, during a sunny afternoon – way too sunny for this latitude. We sought the relief of shade and the comfort of caffeine and talked for hours about art, architecture, people and ourselves before we even laid pen on paper. When we finally did, I was happy that I chose an A4 sketchbook, so that the background would fit together with her portrait. I also had the chance to go through Marie’s impressive sketchbook. It was inspiring for me not only because of the quality of her sketches, but also because she sketches mainly from her imagination – something that doesn't come naturally to me any more after years of sketching what I see. She says imagination is like a muscle and needs practice. I guess she’s right. It’s like every other skill. Next exhibition I will buy one of your sketches and would like to join you! Trädgårdsföreningen i hjärtat av Göteborg.